Have you ever wondered whether the forensic science you’ve seen on TV is anything like the real thing? There’s no better way to find out than to roll up your sleeves and do it yourself. 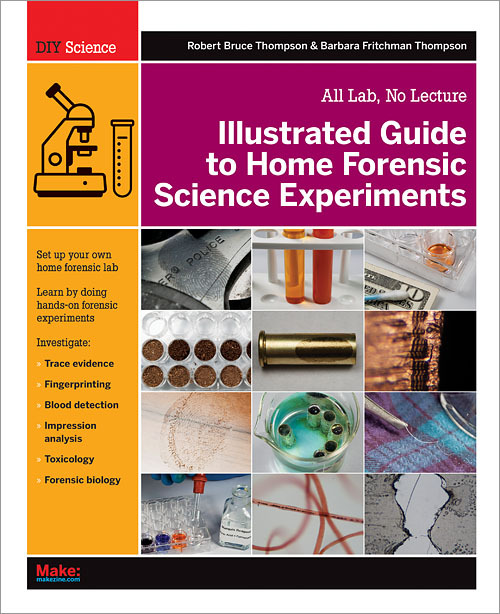 This full-color book offers advice for setting up an inexpensive home lab, and includes more than 50 hands-on lab sessions that deal with forensic science experiments in biology, chemistry, and physics. You’ll learn the practical skills and fundamental knowledge needed to pursue forensics as a lifelong hobby—or even a career. The forensic science procedures in this book are not merely educational, they’re the real deal. Each chapter includes one or more lab sessions devoted to a particular topic. You’ll find a complete list of equipment and chemicals you need for each session. Through their company, The Home Scientist, LLC (thehomescientist.com/forensics), the authors also offer inexpensive custom kits that provide specialized equipment and supplies you’ll need to complete the experiments. Add a microscope and some common household items and you’re good to go.